I topped up S$30 to upgrade to the Large Size, chose a Dual Monitor Arm for S$159 (S$109 after the S$50 discount), and added on a Cable Management Tray for S$28. AmpDesk comes with two height options. Standard Height allows you to adjust the table height from 73 cm to 123 cm and Extended Height from 63 cm to 125 cm. Both White and Black are available for Standard Height while the Extended Height is only available in Black. Next, we moved on to the surface colors and materials. There are six pre-defined options that you can choose. Marinus Walnut, Hampshire, American Ash White, ErgoCurve Carbonised Bamboo, Totally White, and Graphite. All the options cost S$99 except for the ErgoCurve Carbonised Bamboo which costs S$279. 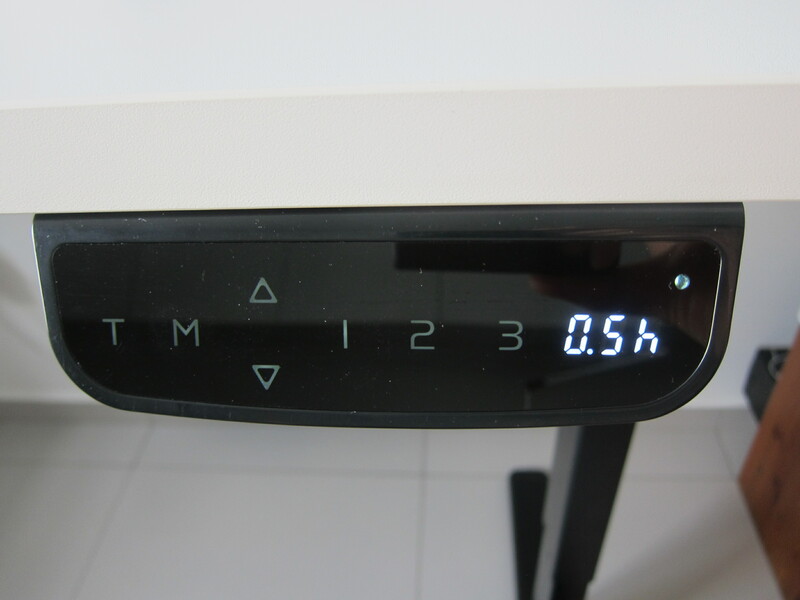 The thickness of the table top is 2.5 cm, and it has a maximum load capacity of 100 kg. For the electronic control pad that controls the height of your standing desk, you can choose from the Up-Down keypad or Memory Keypad for an additional $29. If more than one person is using the desk, I will recommend the Memory Keypad. The dual motor system will give your table a lift speed of 3.8 cm per second. When the table is moving, the noise produced is minimal. On paper, it states that the noise level is around 50 dB which is about the noise level of a normal conversation in a quiet suburb home. 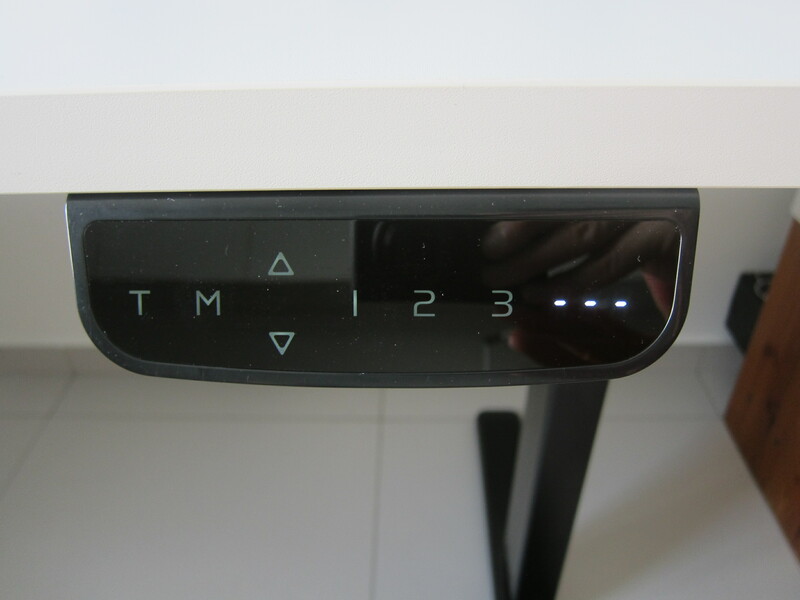 AmpDesk has built-in collision avoidance system. So if the table is moving and it encounters objects in its way, it will come to a complete stop. This prevents accidents and injuries that may arise from the rising or lowering of the table. By default, the table will not come with any cut-out for wires aka grommet. You have to top up S$58 to have the power grommet. It is available in both black or white. 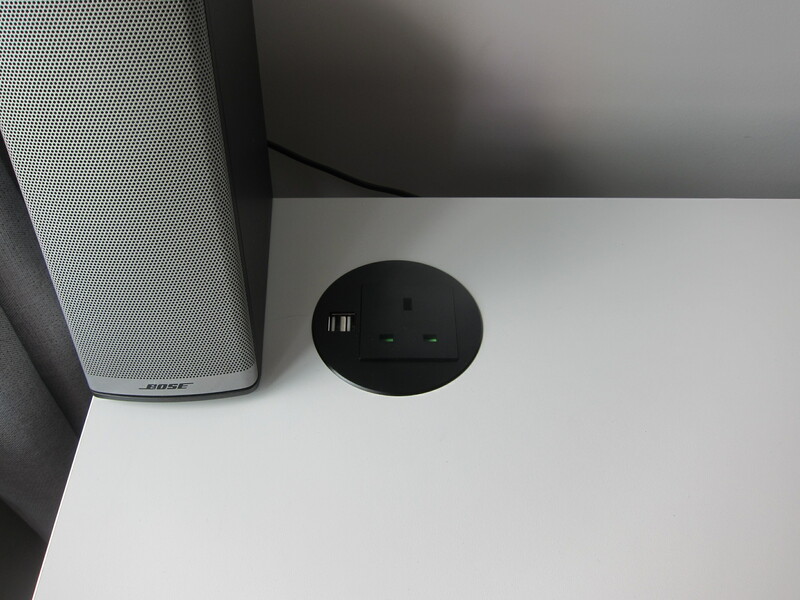 The power grommet set will come with one power grommet which consists of a power socket and two USB charging ports and one wired grommet just for letting your wires pass through the desk. 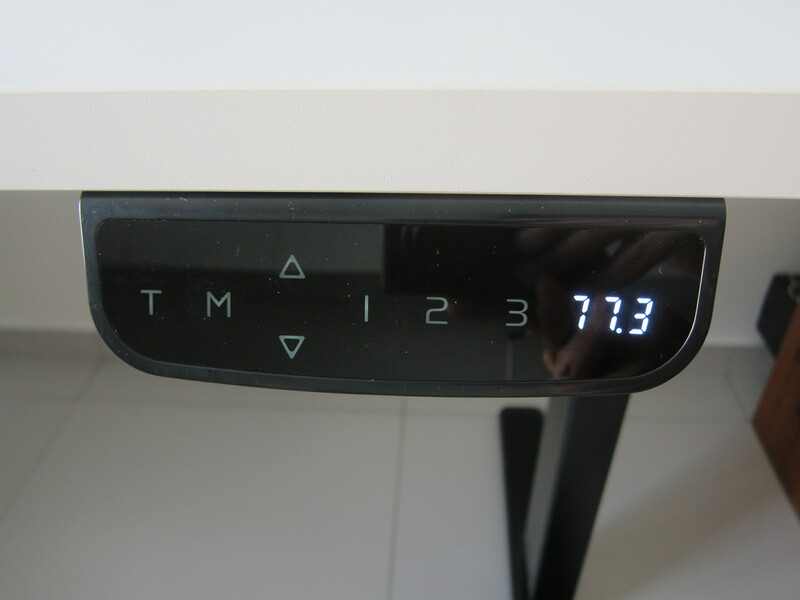 There are six desk accessories that you can add on to your standing desk. Monitor arms, laptop stand, standing mat, cable management spine, cable tray, and CPU mount. I only opted in for a dual monitor arm and a cable tray. 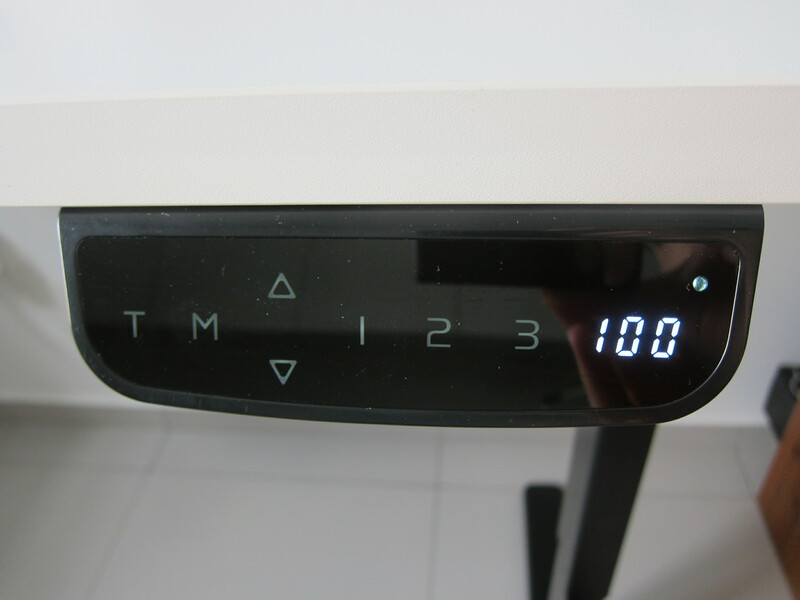 AmpDesk comes with a standard three years warranty, or you can extend it to seven years for an additional S$100. Personally, I think three years is enough. Delivery is free, but you have to assemble the table yourself. I think that is the fun part. 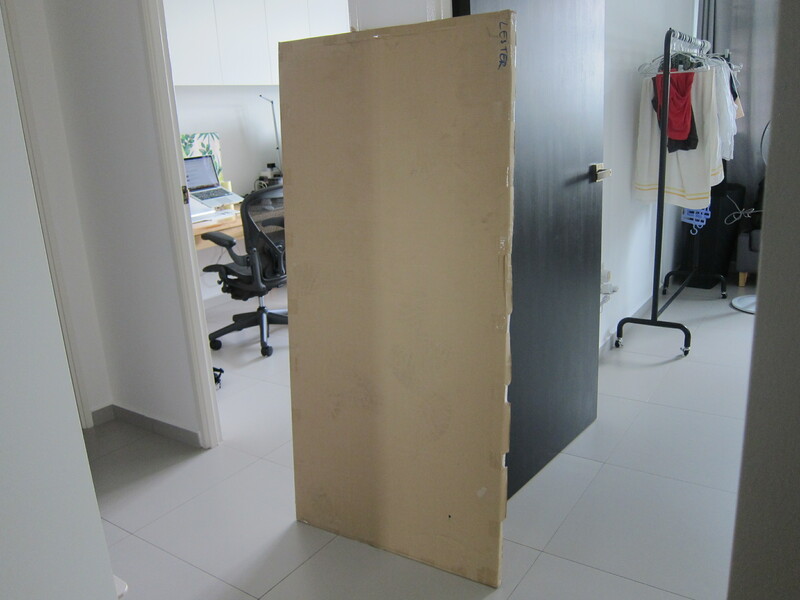 However, if you choose to get the delivery guys to assemble for you, it will be an additional S$45. Do note that the delivery and assemble is outsourced to a 3rd party partner. I placed my order on 16th April 2018, and the desk got delivered to me on 21st May 2018. The reason it took more than a month is that ErgoEdge has quite a backlog to clear. 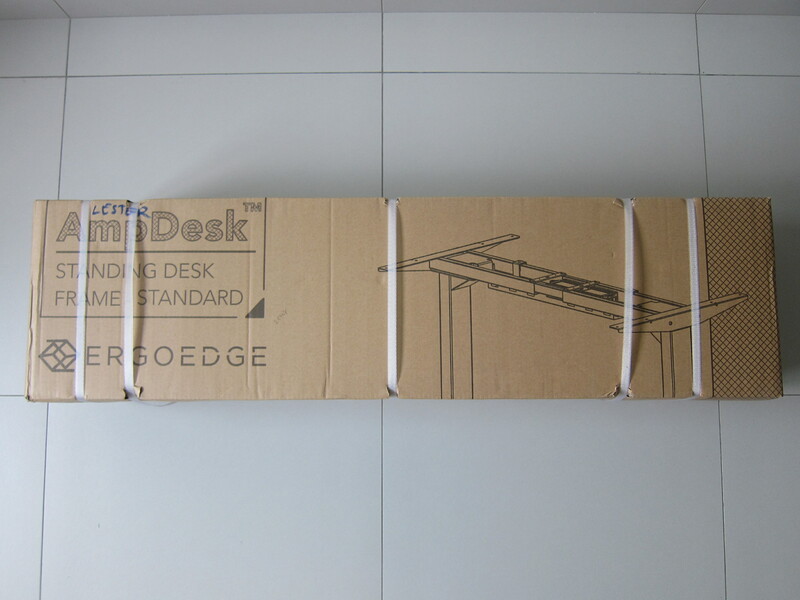 It seems that ErgoEdge’s backlog has cleared and now the delivery time is back to normal, which is between 7 to 14 days. My total cost comes out to S$1,152, and after the S$886 discount, I paid S$266 for the above configuration. ErgoEdge is kind enough to throw in a free assembly worth S$45 for me. The assembly took about 30 minutes. The installer recommends using power tools as it is quicker and the screws will be fastened more tightly. The desk is heavy. The frame itself weighs 30.5 kg, and the table top itself is around 20 kg. Due to the design and the weight of the desk, I find it extremely sturdy. It doesn’t wobble when it is being lifted or lowered. I am surprised at how quiet the dual motor system is. My house is just beside a road, and the ambiance noise masked the noise coming out from the motor. 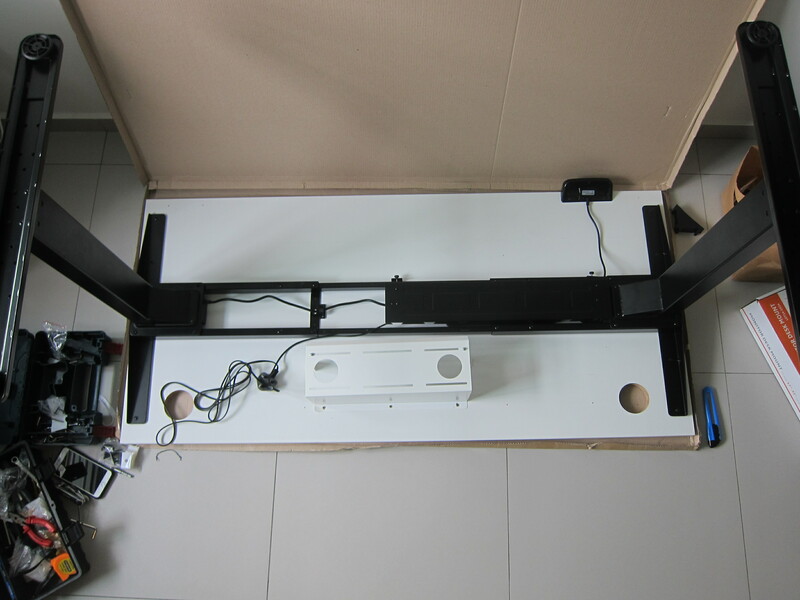 To get a sense of the noise level of the dual motor system, I have closed my room windows and door and recorded the video below of the table lifting. 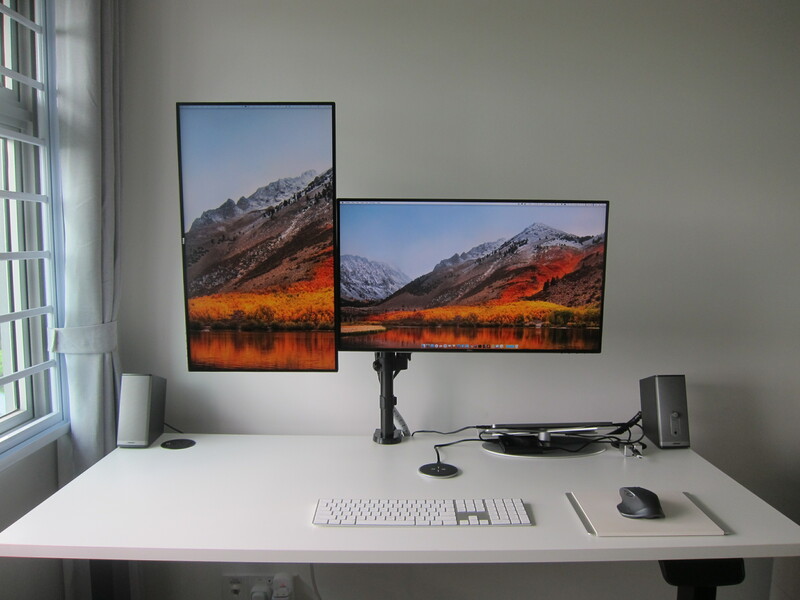 I opted for Dual Monitor Arm as I am using two Dell UltraSharp 27 InfinityEdge Monitors (U2717D) with my Apple MacBook Pro 13″ with Touch Bar and Touch ID (Mid 2017). 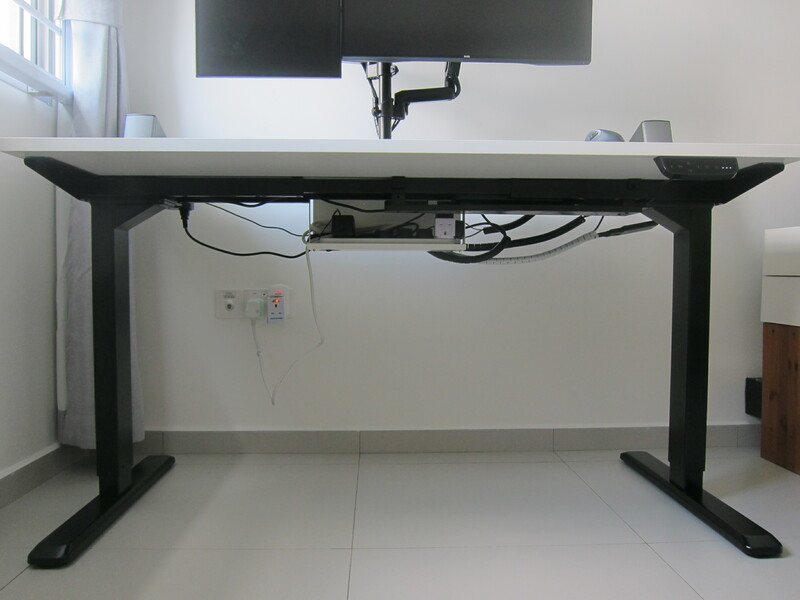 It is recommended to get a cable management tray together with your standing desk as it only cost an additional S$34. This is to keep all your cables neat and tidy. 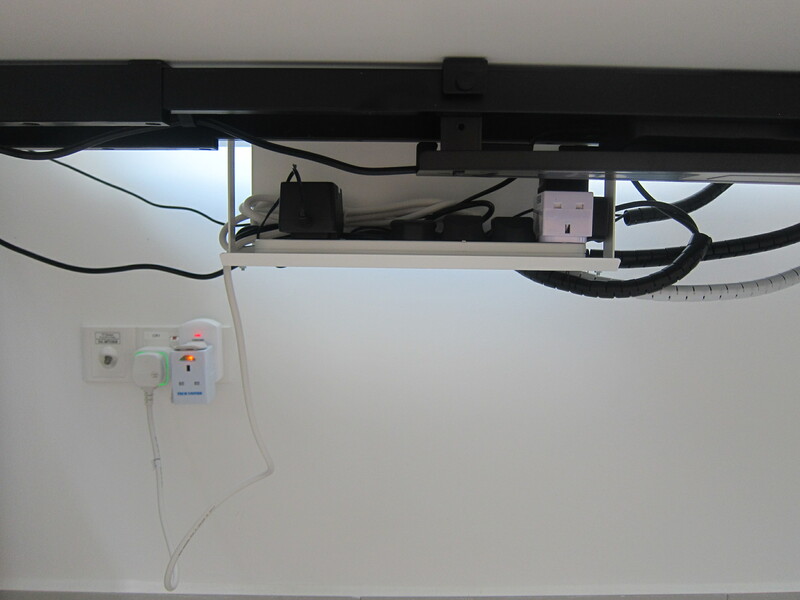 The general rule of the thumb is to get a power strip and hence you will have just one cable going out to your wall socket. 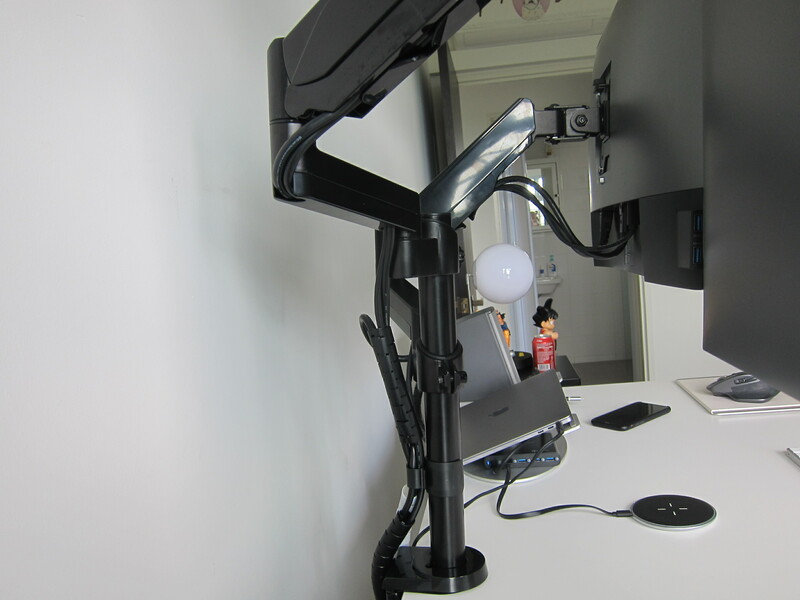 Ensure that you leave some slack cable so that it will not pull against the standing desk when it is lifting. I am using Belkin Economy Series 6-Socket Surge Protector which I bought from Challenger for S$49. Out of six sockets, two will be occupied. One for the power grommet and one for the dual motor system. So you are left with four outlets. The power grommet is useful if you need to quickly remove your laptop charger or charge your phones using the USB-A ports. For me, I am using the Evri 80W USB-C Charging Station to charge my MacBook Pro, and it comes with four additional USB-A charging ports. So I have no use for the power grommet yet. There are three memory slots available in the Memory Keypad. For me, the first slot is my standing height, the second slot is my sitting height, and the third slot is my wife’s standing height. If you need to be reminded to stand, there is a built-in timer feature available in the Memory Keypad. 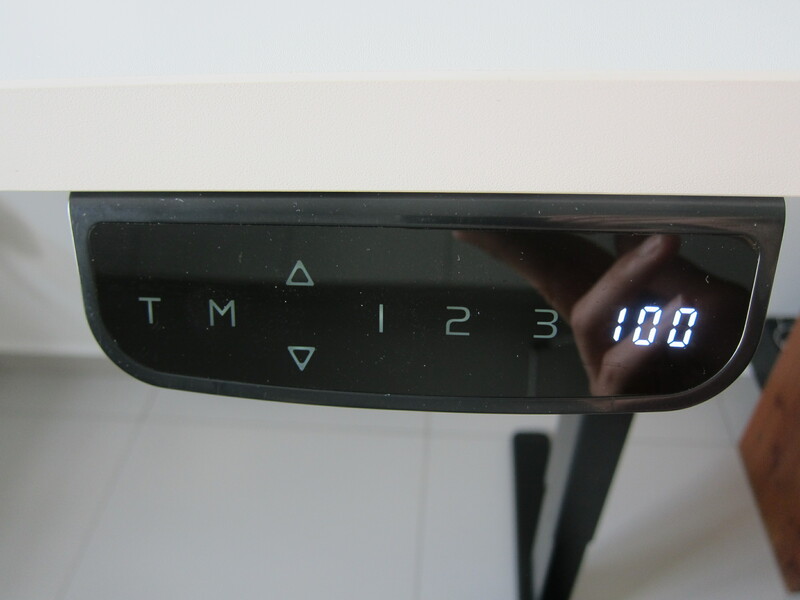 When a timer is set, the circular dot on the Memory Keypad will be lighted, and when it is up, the Memory Keypad will emit a beeping sound. You can set it to remind you every 30, 60, 90 or 120 minutes. The Memory Keypad prevents accidental touch by going into idle mode after one minute of inactivity. When in idle mode, you need to press and hold the “M” button to make it go back to normal. This also prevents children from accidentally touching the buttons. After ten minutes in idle mode, it will go into the standby mode where the lights on the Memory Keypad will go off. Touching anywhere on the Memory Keypad will make it go back into the idle mode, and as mentioned, you need to press and hold the “M” button to make it go back to normal. 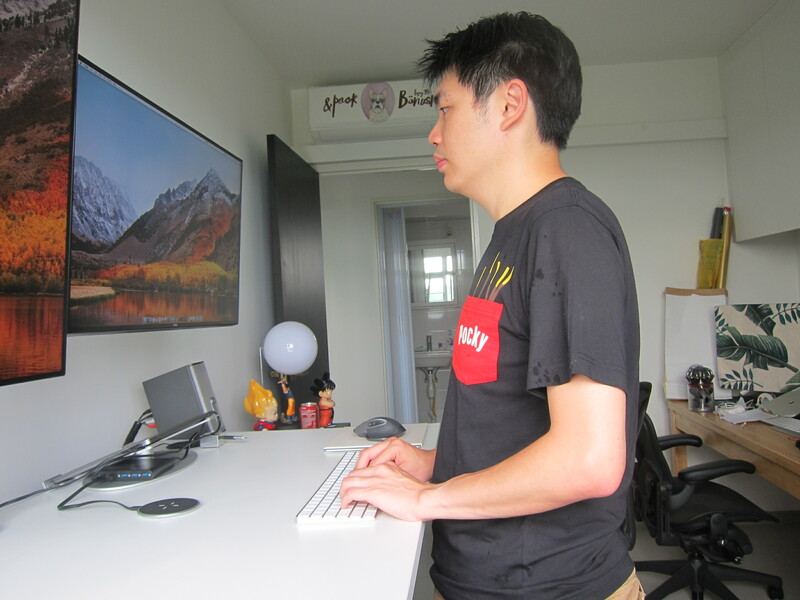 As this is my first time using a standing desk, I am not sure what is the optimal standing desk height for me. 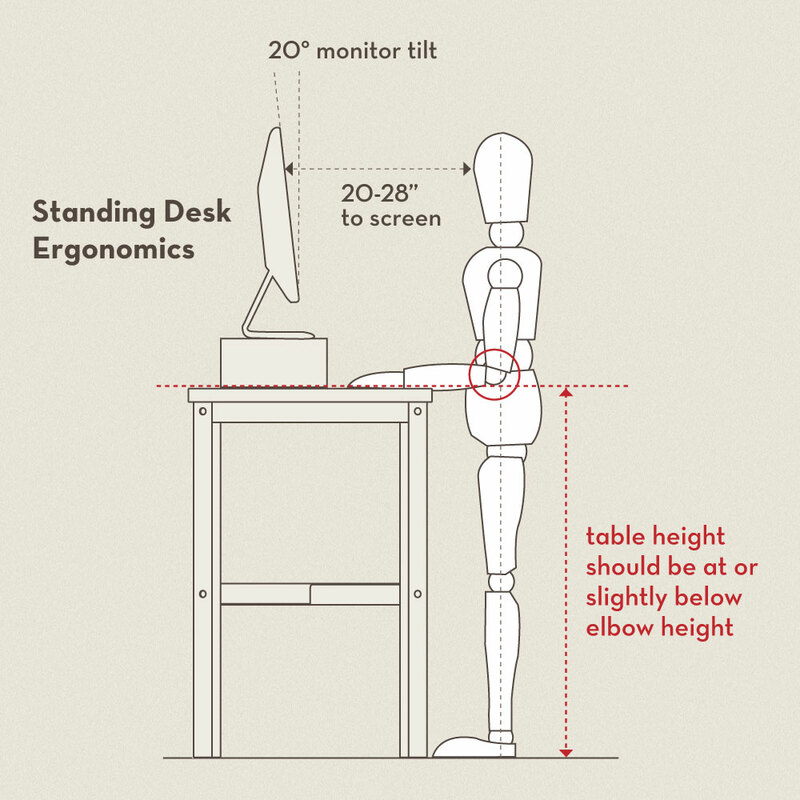 After asking the guys at ErgoEdge and Googling, it seems that the optimal height of a standing desk should be slightly below your elbow. So when your hands are resting on the table, it should be at an angle of more than 90°. My height is about 178 cm. So, for my standing table height, I set it to 100 cm, and for my sitting height, I set it to 77.3 cm. 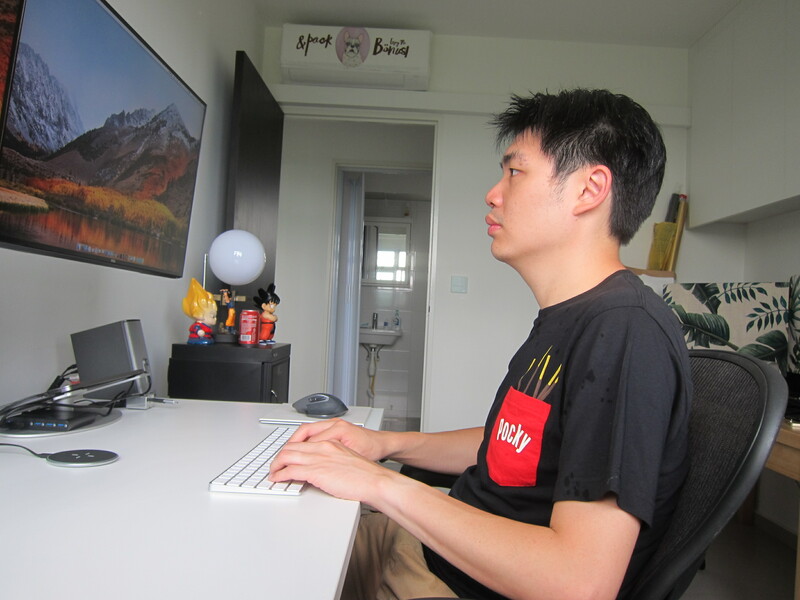 My wife always complains that I have horrible posture when sitting down in front of my computer. I tend to hunch my back and lean towards my monitors. This leads to stiff shoulders and occasional muscle ache on the back. Hopefully, with the standing desk, these symptoms can be reduced. For a start, I am going to try out the 1:1 ratio using the 60 minutes timer. For every hour of sitting, I will stand for the next hour. 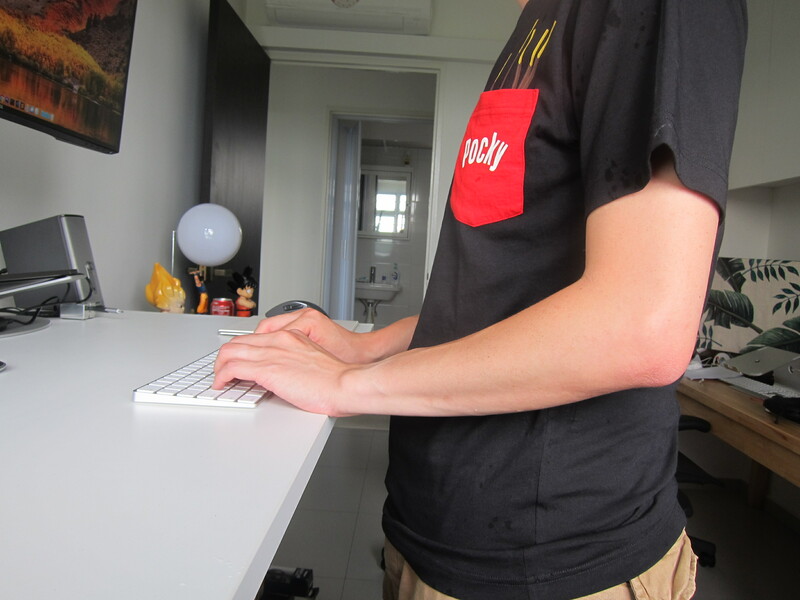 The health benefits of using a standing desk have been greatly disputed. 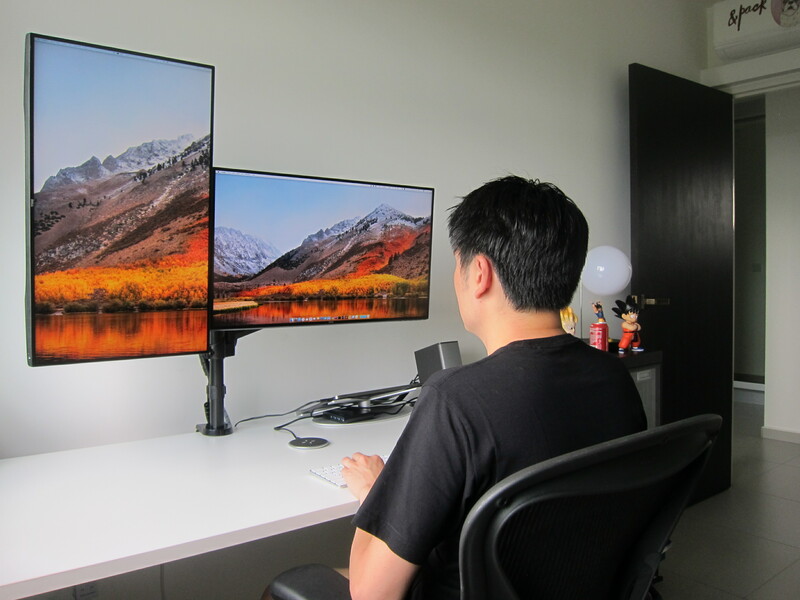 Regardless, even if it doesn’t bring in any significant health benefits, I believe that a standing desk/height-adjustable desk will significantly improve your posture in front of a monitor in the long run. One of the convenience I found in using a standing desk is I can easily walk to my computer and check something and walk off after I am done. This is without the hassle of moving around the computer chair or bending down in discomfort to use my keyboard and mouse. When I am using the standing desk, and deep in thought, I realized I would either fidget my legs or move left and right. I guess this is a good thing as it helps to keep my blood circulated as opposed to spinning around in my computer chair when seated. You can use the discount code LESTER28 when checking out from ErgoEdge and that will give you a S$28 discount. This page is generated on 19th April 2019, 04:28:12 (UTC) in 0.447s with 14 queries using 4.0 MiB of memory.